Happy Thanksgiving from all of us here at ThirdAge to you and yours! 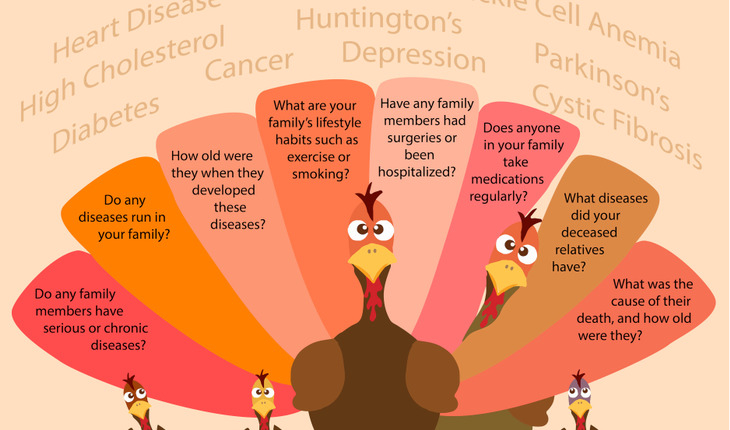 Each year since 2004, the Surgeon General has declared Thanksgiving to be National Family Health History Day. Over the holiday or at other times when families gather, the Surgeon General encourages Americans to talk about, and to write down, the health problems that seem to run in their family. Learning about their family’s health history may help ensure a longer, healthier future together. Health care professionals have known for a long time that common diseases – heart disease, cancer, and diabetes – and rare diseases – like hemophilia, cystic fibrosis, and sickle cell anemia – can run in families. If one generation of a family has high blood pressure, it is not unusual for the next generation to have similarly high blood pressure. Tracing the illnesses suffered by your parents, grandparents, and other blood relatives can help your doctor predict the disorders to which you may be at risk and take action to keep you and your family healthy. To help focus attention on the importance of family history, the Surgeon General, in cooperation with other agencies with the U.S. Department of Health and Human Services, has launched a national public health campaign, called the Surgeon General’s Family History Initiative, to encourage all American families to learn more about their family health history. Americans know that family history is important to health. A recent survey found that 96 percent of Americans believe that knowing their family history is important. Yet, the same survey found that only one-third of Americans have ever tried to gather and write down their family’s health history. Because family health history is such a powerful screening tool, the Surgeon General has created a new computerized tool to help make it fun and easy for anyone to create a sophisticated portrait of their family’s health. The revised version of the “My Family Health Portrait” tool is a Web-enabled program that runs on any computer that is connected to the Web and running an up-to-date version of any major Internet browser. The new version of the tool offers numerous advantages over previous versions, which had to be downloaded to the user’s computer. The Web-based tool helps users organize family history information and then print it out for presentation to their family doctor. In addition, the tool helps users save their family history information to their own computer and even share family history information with other family members. Access the My Family Health Portrait Web tool at https://familyhistory.hhs.gov/ .